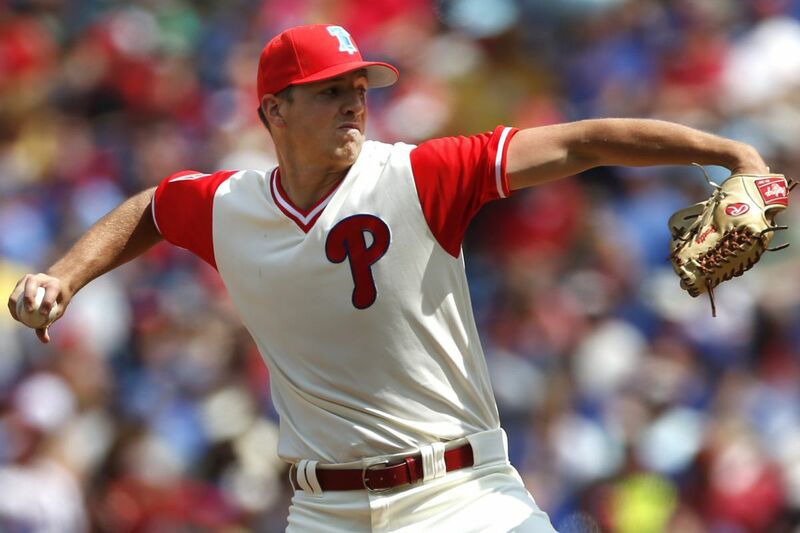 Nick Pivetta throws In the shaky first inning of his 6-3 win over the Cubs. Nick Pivetta spent 17 minutes on the mound Sunday in the first inning. The first Cubs hitter reached on a Tommy Joseph error. The bases were loaded on Pivetta's 11th pitch. He needed 38 pitches to record the game's first three outs. The Cubs scored three runs. It looked much like his previous start, which lasted all of 1 1/3 innings. "He didn't feel sorry for himself," Phillies manager Pete Mackanin said. "He goes out there and he competes." That is one step in the maturation of Pivetta, a 24-year-old pitcher who has a considerable amount of development to make. The Phillies won, 6-3, and Pivetta (5-9) wiggled through five innings. The bullpen needed it. "I felt like I really needed to step up here," he said. "It's really, really nice just to go out there after how hard I've been working the past couple weeks, with what's happened the past month, to go out there and really just have a quality outing." The right-hander's ERA is 6.57 in 20 starts. He walked four batters for the first time since July 2. His day should have been worse, if not for a miraculous triple play to erase a fifth-inning threat. "I can't believe that happened," Pivetta said. "If there's one way I was getting out of that inning, that's what was going to happen. Sometimes the baseball gods are just in your favor, and that's the way it goes." If the situation was different, the Phillies would have Pivetta continue his development in the minors. But this team is dedicated to learning more about its young players for the final five weeks. "He found himself on the mound," catcher Cameron Rupp said. "He didn't do more than he could do. He made pitches when he needed to." Against a team that drubbed them for 17 runs the night before, the Phillies will take that. Their hope is, in five days, Pivetta applies it from the very beginning. Freddy Galvis started at shortstop for the 129th consecutive game. He is the first Phillies position player to start in at least that many straight games since Jimmy Rollins, who had a 230-game streak from 2006 to 2008. Galvis has declared his intention to start all 162 games this season at short. It is part of the reason why J.P. Crawford has been tried at second and third base with triple-A Lehigh Valley in recent weeks. That way, if Crawford comes to the majors in September, he can find at-bats without disrupting Galvis. … Zach Eflin (right shoulder soreness) is hopeful he can return sometime in September, but he has not thrown a ball since Aug. 18. … Aaron Nola will face rookie right-hander Lucas Sims in Monday's series opener against Atlanta.